Until about 2004, most scientists believed that women were born with all the reproductive eggs they would have for the rest of their lives. Then a scientist named Jonathan Tilly published research that claimed women might actually replenish their supply of eggs throughout their lives. It was shocking. The previous school of thought was that women's eggs became old and deteriorated over time until their supply was exhausted and menopause set in. If Tilly's findings were true, it would completely change the way we looked at fertility and menopause. But other scientists couldn't reproduce the revolutionary findings so most didn't believe the phenomenon was real. But Tilly never gave up trying to prove it. Now he's back with even more convincing data that could turn the limited-lifetime-supply theory on it's head, and could even eliminate the need for in vitro fertilization. Tilly, who is director of the Vincent Center for Reproductive Biology at Massachusetts General Hospital, says he and his colleagues have discovered stem cells in adult human ovaries that engender the growth of new eggs. 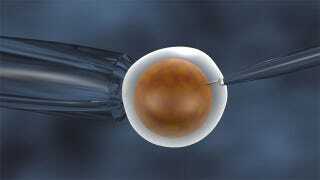 It would be analogous to the stem cells that lead to the regeneration of sperm in men. They isolated some of the stem cells and grew them in a dish, where they exhibited human egg-like qualities: they contained half of all the genetic material present in the body. The researchers then inserted a glowing-green genes into the cells so they could follow their path as they grew. They grafted the cells into mice, and about two weeks later, they saw egg cells with glowing green tissue, which the researchers say means the egg cells had come from the stem cells. But other scientists are still skeptical that the results are real. The number of stem cells present in an ovary is apparently very small, and no one knows yet whether they might engender new eggs throughout a woman's life or only sometimes. We also don't yet know if it's possible for eggs grown in this manner to become actual fertilized embryos—which is what would make IVF no longer necessary.